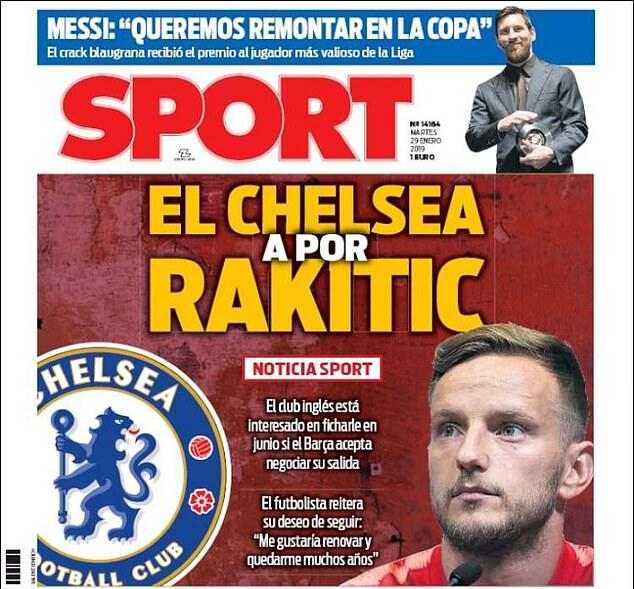 And according to Spanish outlet Sport, the Blues have pinpointed Barcelona’s Ivan Rakitic as one ideal addition. The front cover of their publication on Tuesday leads with this story – stating that Chelsea are ready to negotiate with Barca over the possible signing. However, they report that the midfielder would prefer to remain at the Nou Camp – despite the imminent £65million acquisition Frenkie de Jong from Ajax. Speaking about his future recently, Rakitic made it clear that he wishes to stay in Catalonia. ‘If I am here [at Barcelona], it’s to play,’ he said. ‘I want to be here and, if I can renew, to be here for even more years. I am really happy here, everyone knows it, above all the president. I have nothing else to say.